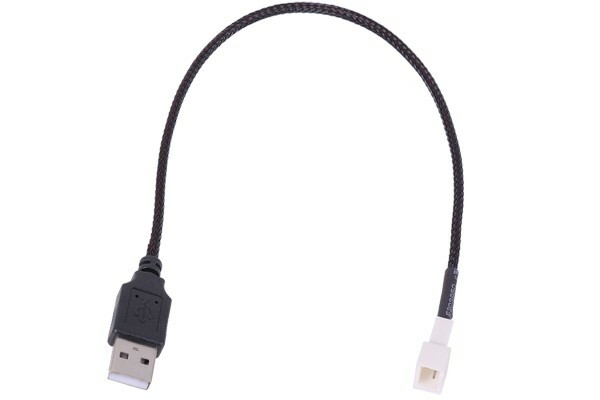 With this cable it is possible to operate a fan simply via an USB connection. The voltage is just right to operate a fan quietly and with a pleasant airflow. When looking into operating a fan outside of the system enclosure, and the hot summer months are coming up, this is the perfect solution to quickly make a computer fan into a desk fan! Bonjour, Je viens de recevoir cet article et il ne comporte que 2 pins (l'étiquette sur l'emballage indique pourtant bien 3 pins). There are only two pins for mass and voltage, no speed signal. Ist das ein 3Pin Molex Stecker, oder hat der nur 2 Pins?